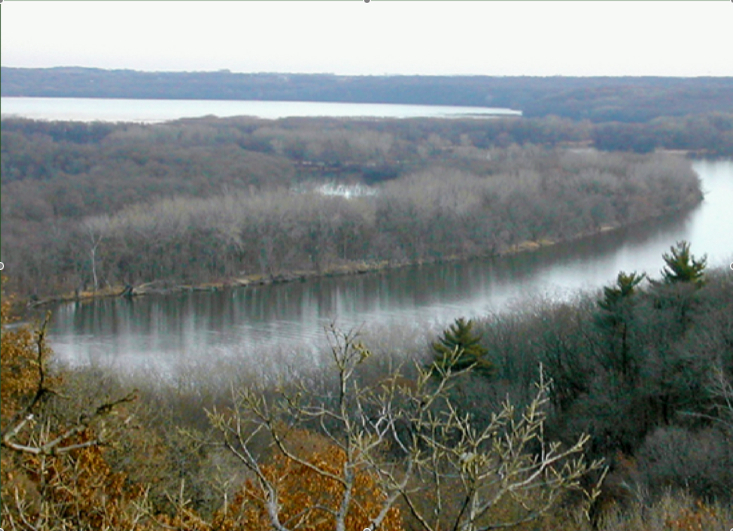 From the bluff at River Oaks Park in Cottage Grove, one of the most stunning views of the Mississippi. As autumn turns the trees, this is an especially good time of year to enjoy sweeping river valley views. This month in our 25 Special Places silver anniversary series, we're profiling a few of our favorite metro promontories. First, a quick note on timing your visit: While mid-October is typically still within the Twin Cities' peak color window, don't worry if you can't get out right away. Fallen leaves mean barer branches and a clearer view of the river flowing below. Located in Inver Grove Heights just 20 minutes south of downtown St. Paul, Pine Bend Scientific & Natural Area is considered by many to offer the best views of the Upper Mississippi River Valley. Although a highly protected state-owned natural area, there is no entry fee and no state park sticker required for access. At the main entrance you'll find a parking lot and restrooms. Head towards the "welcome" sign and take the unpaved trail eastward into the park. After passing a neighbor's shed on your left, walk a few more minutes to emerge in a beautiful blufftop goat prairie, home to stunning river valley views. Be sure to look around and enjoy the lovely bluestem and other prairie grasses you're standing among. Most were planted from seed gathered by fellow FMR supporters and volunteers; views from the bluff help make this one of our most popular habitat restoration sites. Looking to enjoy a beautiful eagle's eye view and some peace and solitude? Head to River Oaks Park in Cottage Grove. To get here (see the map below), you'll wend your way down suburban streets to the dead end of a sleepy cul-de-sac. Pull into one of the small parking spots, then take the footpath to the right. It may not feel like you're heading west towards the Mississippi — or that you're on public land — but you are. After a few minutes' walk, the forest will thin and you'll find yourself on a blufftop prairie edged with lovely old oaks towering above the coursing river below. If you have little ones with you, note that there are no guardrails. Bring binoculars if you can. Downriver you can see the Hastings spiral bridge and other landmarks. Plus, once-rare pelicans and eagles are frequent passersby. And as you appreciate the view, be sure to take a moment to thank FMR volunteers and ecologists who helped clear out the buckthorn here. 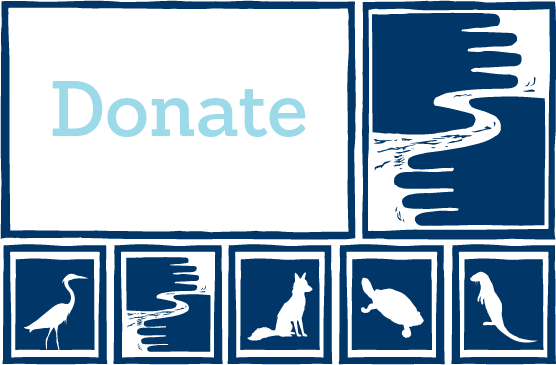 They've helped keep the prairie, and the important bird habitat it provides, healthy. Situated above Interstate-94 in St. Paul's East Side neighborhood, it's easy to drive by (or below) this beloved regional park without stopping to enjoy it. But Indian Mounds Regional Park is well worth your time. This park is accessible by bus. Routes 70B and 70S both stop at the Plum Street and Mounds Boulevard intersection, just steps from the famed overlook. The view from the main overlook near Plum Street is literally on dozens of "St. Paul" postcards. But the blufftop park is also rich in history. The park contains six burial mounds believed to have been built 1500 to 2000 years ago by the ancient "Hopewell" people. Visitors can view and walk among the mounds. With a view like this, it's no wonder the early inhabitants of the area wanted their loved ones to be buried here. Local FMR volunteers have helped to restore the blufftop prairie here, creating much-needed habitat for bees, birds and other pollinators while improving the view to the river valley. Okay, so this one isn't really an overlook, but it sure offers beautiful views. A couple blocks north of Broadway Avenue along the river in North Minneapolis, Ole Olson is an FMR staff and volunteer favorite. Here, you can step onto the trail and stroll along a volunteer-planted prairie patch buzzing with bees, birds and other pollinators as the Mighty Mississippi flows by just steps below. In the distance, the Minneapolis skyline is a bit of a scene-stealer, but be sure to turn your eyes to the river where a beloved "volunteer" beaver is spotted fairly frequently. Zoom in to explore our interactive Special Places Map. Click on the deep red stars to learn more about the locations profiled in this article. To view the map full-screen, click the squarish icon in the top right corner. 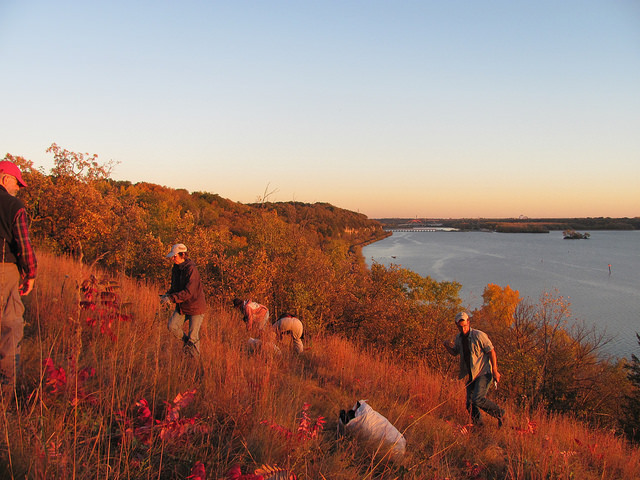 This profile of scenic overlooks is part of FMR's 25 Special Places project, which we undertook to celebrate our silver anniversary year and the metro Mississippi River in 2018. We've compiled all these places into our Explore the River page, an interactive Google map and set of guides to help you get to know the river that shapes our metro area. Each of these vistas is an FMR volunteer site. If you'd like to help restore habitat and maintain these lovely views, contact FMR Volunteer Coordinator Amy Kilgore at volunteer@fmr.org.